President of The Integration Company and your main contact, Derek Radoski has an extensive 23-years of integrated security experience. 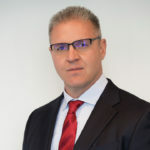 Derek is a revolutionary security leader with specialties including IP video, smart cards, biometrics, turnstiles, enterprise security projects, and merging intellectual and physical security. He is certified by American Society of Industrial Security (ASIS) and a Certified Protection Professional (CPP). Derek is a dynamic public and motivational speaker, teaching over 100 courses in IP video solutions, analog surveillance and networked access control. The Integration Company (TIC). President. Founded in 2009, TIC is a trusted partner of security systems integration for government and commercial clients. ASIS International. Mentorship Committee Chair. X7 / SDI . Senior Vice President acquiring several contracts (Virginia Tech, Kentucky State, Maryland State (Correction) and the Baltimore Social Security Administration campus). X7 / SDI Recognitions of Excellence include AMAG Dealer of the Year, Arecont Vision Partner of the Year, Verint Partner of the Year and Fast 50 by Security Industry Association (top 10). ADT Advanced Integration – Director of Federal Sales. SST Security-Systems Technology – Director of Sales. Security Solutions – Represented the first Digital Video Recorders Image Vault and JVC V- NET IP addressable cameras.